Genuine OEM Canon Toner Cartridge, Cyan, 9,500 page yield. Canon part number: 2448B003AA, GPR-26C. Color Laser Toner Cartridge compatible with Canon imageRUNNER C5058, C5068, C5800, C5870, C6800, C6870. Genuine OEM Canon Toner Cartridge, Magenta, 9,500 page yield. Canon part number: 2449B003AA, GPR-26M. Color Laser Toner Cartridge compatible with Canon imageRUNNER C5058, C5068, C5800, C5870, C6800, C6870. Genuine OEM Canon Toner Cartridge, Yellow, 9,500 page yield. Canon part number: 2450B003AA, GPR-26Y. Color Laser Toner Cartridge compatible with Canon imageRUNNER C5058, C5068, C5800, C5870, C6800, C6870. Genuine OEM Canon Toner Cartridge, Black, 40,000 page yield. 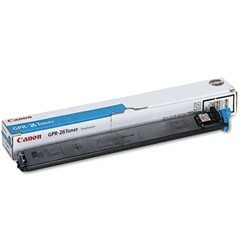 Canon part number: 2447B003AA, GPR-26BK. Laser Toner Cartridge compatible with Canon imageRUNNER C5058, C5068, C5800, C5870, C6800, C6870.